This guide explains how the fields in TheraNest populate the CMS 1500 claim form. Click here to see how to view the CMS 1500 form for the invoice. 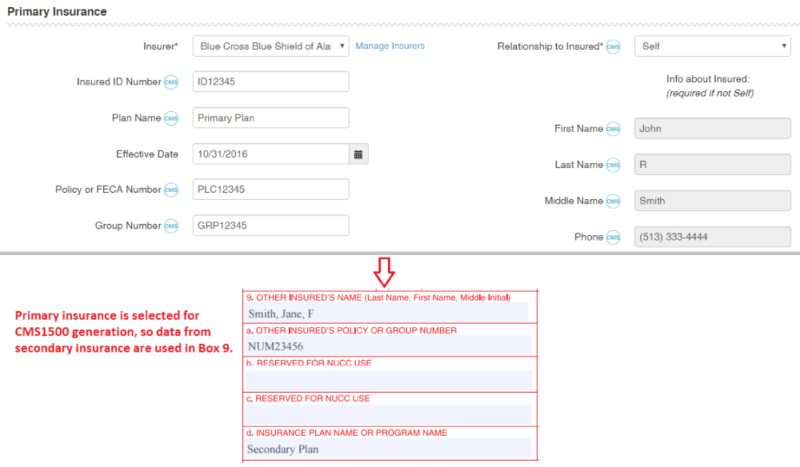 Carrier block is filled with Insurance Organization's name and address from Insurer Details page. Current insurer's insurance type from "Insurer Details" page. Insured’s ID Number from client's "Bill To & Insurance Info" page. 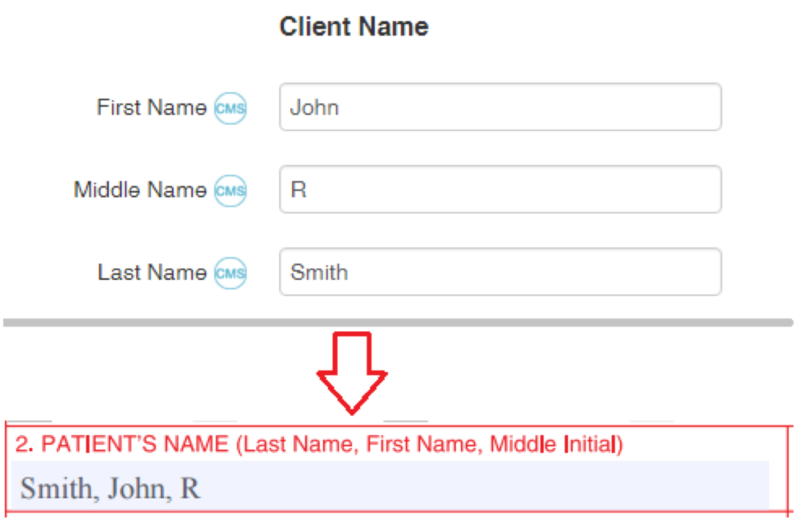 Client's name in format: Last Name, First Name, Middle Initial, e.g. "Doe, John, F"
Client's DOB and Gender from "Client Details" page. Insured's name in format: Last Name, First Name, Middle Initial, e.g. "Doe, John, F". If Relationship to the Insured is "Self", then the data is taken from the Client Details page. 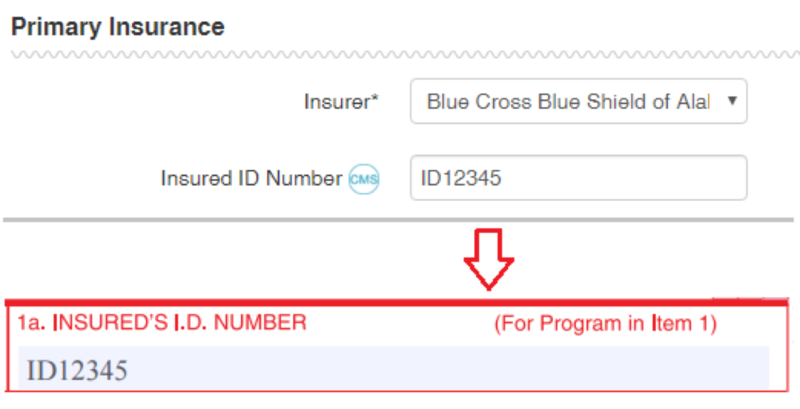 Otherwise the data is taken from the "Info about insured" block on the"Bill To & Insurance Info" page. Telephone is the first non-empty value of following fields: Phone from "Bill To & Insurance Info" page; Mobile Phone and Home Phone from "Client Details" page. In other words, if "Bill To Phone" is populated, the value is taken from there. If it's empty, then the value is taken from Mobile Phone from the "Client Details" page. If Mobile Phone is empty, then the value is taken from Home Phone from the "Client Details" page. Relationship to insured from "Bill To & Insurance Info" page. 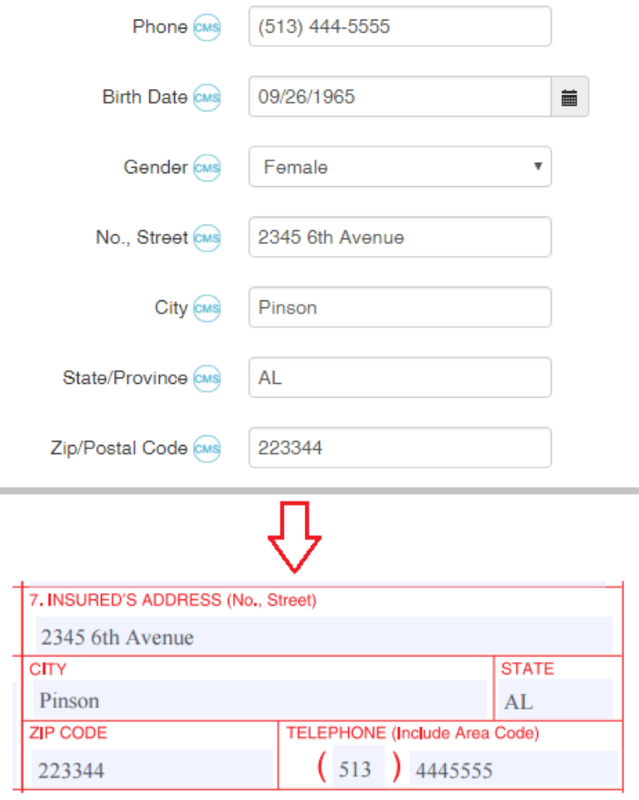 Insured's address from "Bill To & Insurance Info" page. If Relationship to Insured is "Self", then the data is taken from the Client Details page. Otherwise the data is taken from the "Info about insured" block on the "Bill To & Insurance Info" page. Is not filled in TheraNest. 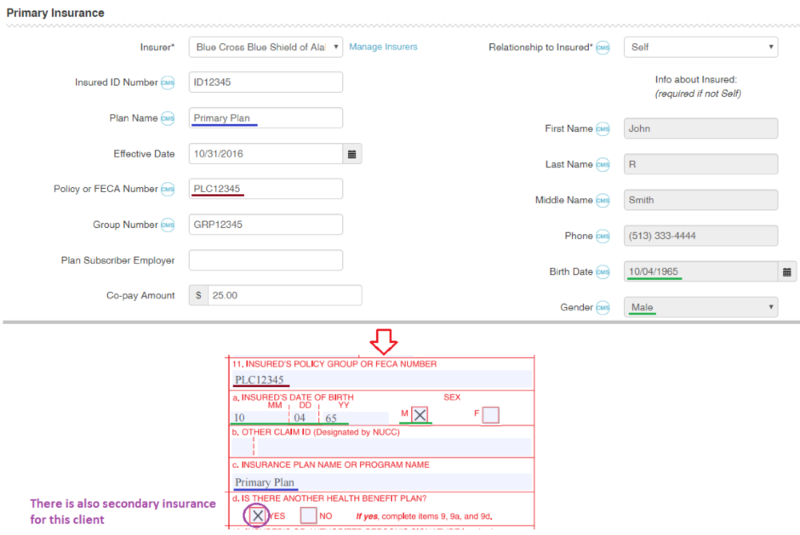 “Other Insured's name”, “Other Insured's Policy or Group Number” and "Insurance Plan Name or Program Name" fields are taken from client's insurance that is not used for CMS1500 generation. Value for “Other Insured's Policy or Group Number” is taken from "Policy or FECA Number" field in TheraNest and if it's empty, the value is taken from "Group Number" field. 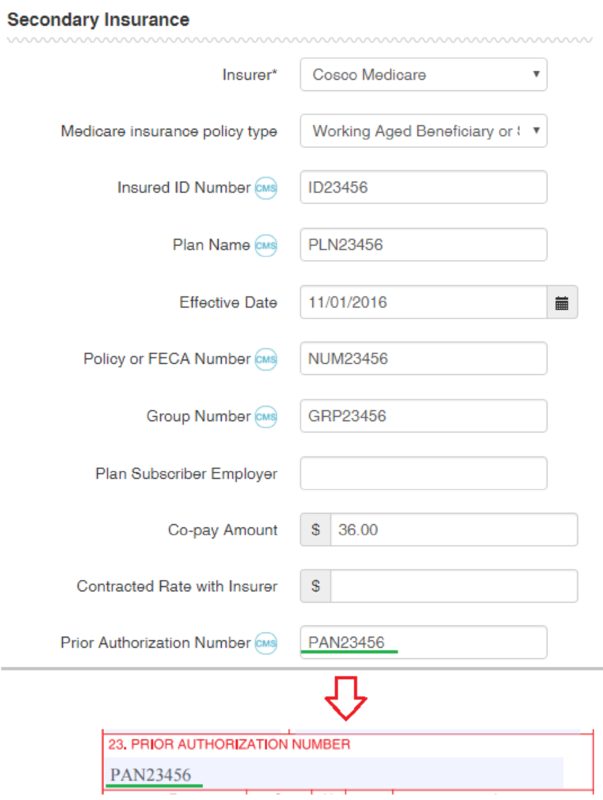 If the secondary insurance is used for CMS1500 and it's type is Medicare, then this box is left blank. Boxes 9.b and 9.c are not filled by TheraNest. 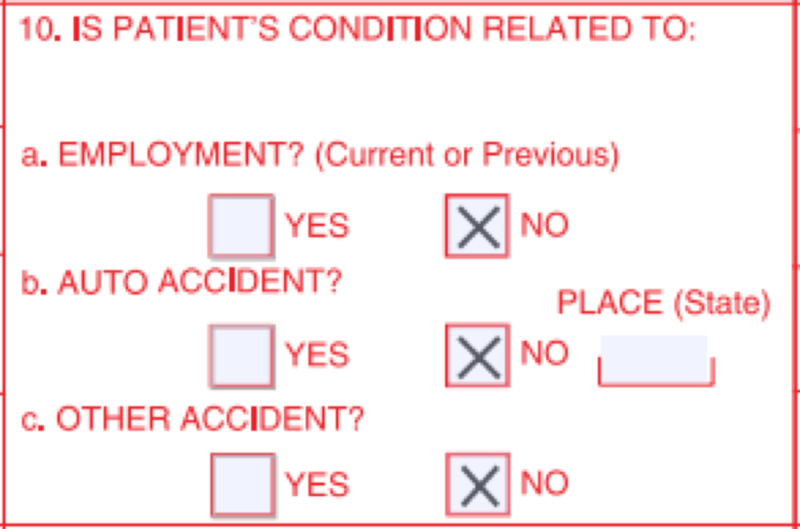 On the client's Bill to and Insurance info page there is a drop down that says: "Is client's condition related to an accident?" with options No (default), Employment, Auto Accident, and Other Accident. If anything besides the default is selected, users will be prompted to enter more information which will be used to populate Boxes 10A - 10C on the CMS 1500 Form. If No is selected then all flags will be marked to no. Box 10.d is not filled by TheraNest. Box is filled depending on insurance type. If selected insurance is secondary and it's type is Medicare, then these values are taken from Primary Insurance. If the relationship to Insured is "Self", then DOB and Gender (Box 11.a) are taken from the Client Details page. Box 11.b is not filled by TheraNest. If "Release Medical Records and Billing Info to Insurance" flag from "Bill To & Insurance Info" page is "Yes", then "SIGNATURE ON FILE" value is used; Date is the date of form creation. If the flag is off, then both fields are empty. If "Authorize Payment to Provider" flag from "Bill To & Insurance Info" page is "Yes", then "SIGNATURE ON FILE" value is used. If the flag is off, then the field is empty. Is not filled by TheraNest. Populated from Referrer section on the "Bill To & Insurance Info" page of a client's record. The name and NPI of the referring provider must be entered in order for box 17 to populate. Qualifier: "DN" if referrer name has value, otherwise it's empty (both Name and Qualifier depend on Referrer NPI). The modifier DQ will populate when the toggle for "Use Supervising Provider on Claims" is marked to YES. 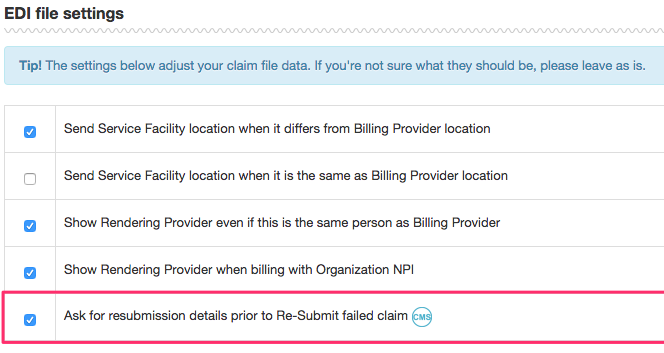 You can only toggle "Use Supervising Provider on Claims" when the referring provider's full name and NPI is populated. Box 17.a is not filled by TheraNest. Box 17.b is Referrer NPI. ICD-9 is used only for services performed before October 1, 2015. 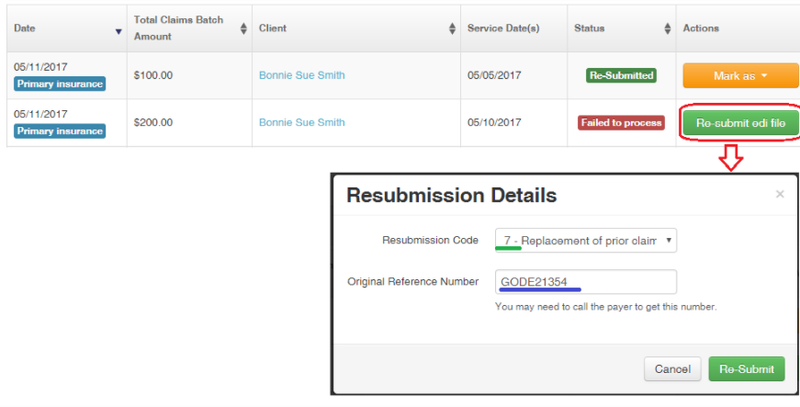 Populated by first selecting "Ask for resubmission details prior to Re-Submit failed claim" in the EDI file settings of the Insurer Details page (Billing > Insurers). Prior Authorization Number from "Bill To & Insurance Info" page. A. Date of service is taken from Start and End date and time of appointment. B. Place of Service is pulled from the invoice. The dropdown suggests standard values (http://www.cms.gov/Medicare/Coding/place-of-service-codes/Place_of_Service_Code_Set.html), the default value is Office (code 11). C. Is not filled in TN. D. CPT service codes and their modifiers. E. Diagnosis pointer: Letter index(es) of diagnosis in box 21. F. Charges - amount billed for services pulled from invoice. H. Is not filled in TN. I. ID Qualifier of Additional Insurer ID. - Locations of Additional IDs must be "Any" or match Rendering Provider's location. Rendering provider is specified on invoice, location is specified on User Details page. - "Related To" field is "Organization & Any Staff" or matches rendering provider's name. Qualifier is taken from the first Additional Id of sorted by location(items with specific location have higher priority than non-location-specific items) valid additional ids. J. Record consists of two lines. 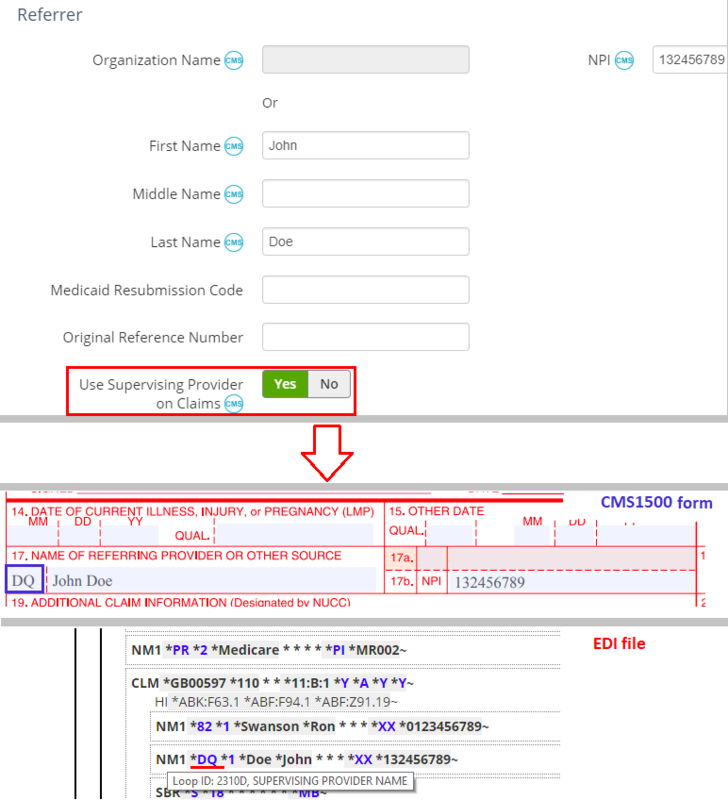 The first line is populated with ID Number of Insurer's Additional ID from column 24.I. The second line is populated with Rendering Provider NPI of the "Staff Member" on the invoice. If PQRS is used, PQRS measures are also put into box 24 after corresponding service. QDC codes are places in column D, diagnosis pointer points to one of diagnoses of parent service. 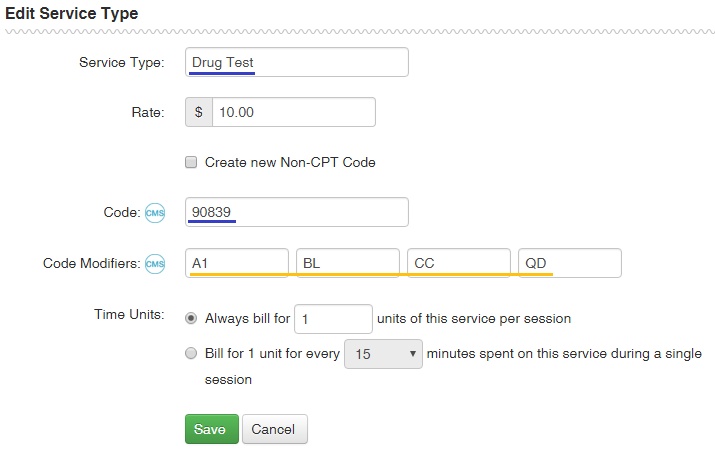 Depends on Billing Provider specified in invoice. If "Bill with selected staff NPI?" box is checked, Tax ID of selected Provider is used. Otherwise Tax ID of Organization is used. 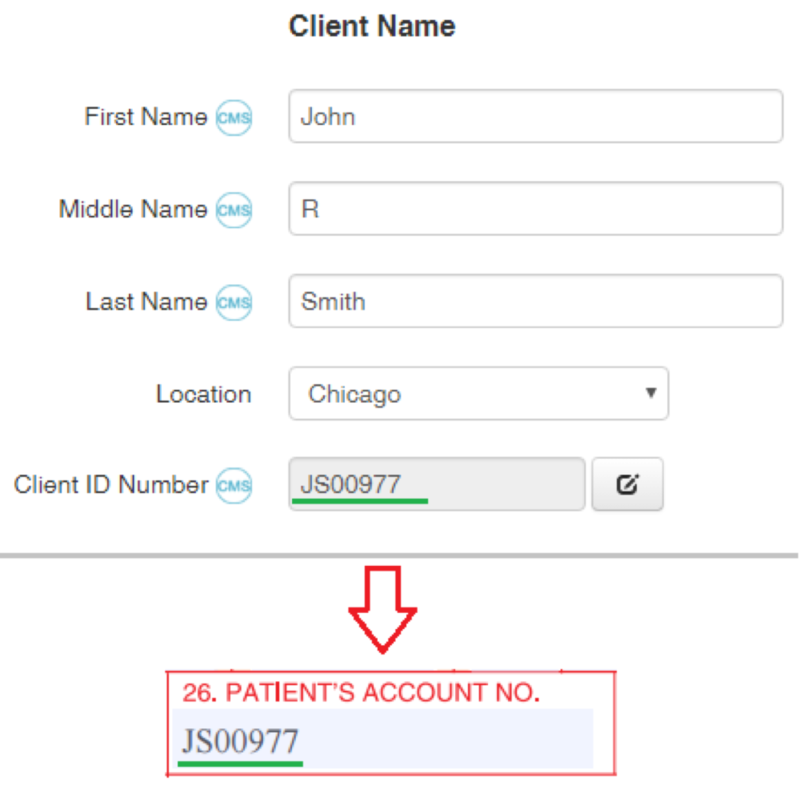 Client ID Number on Client Details page. 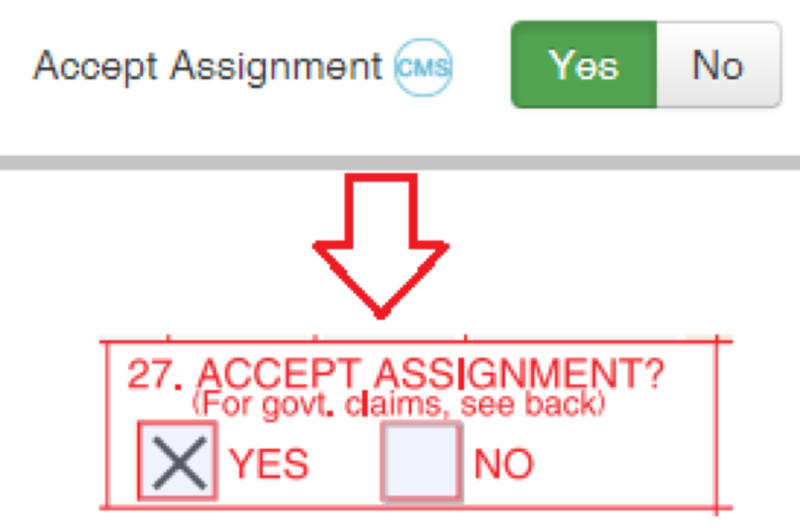 Value of "Accept Assignment" flag on "Bill To & Insurance Info" page. Sum of charges for all services. Sum of payments on invoice. Name of Rendering Provider associated with invoice. 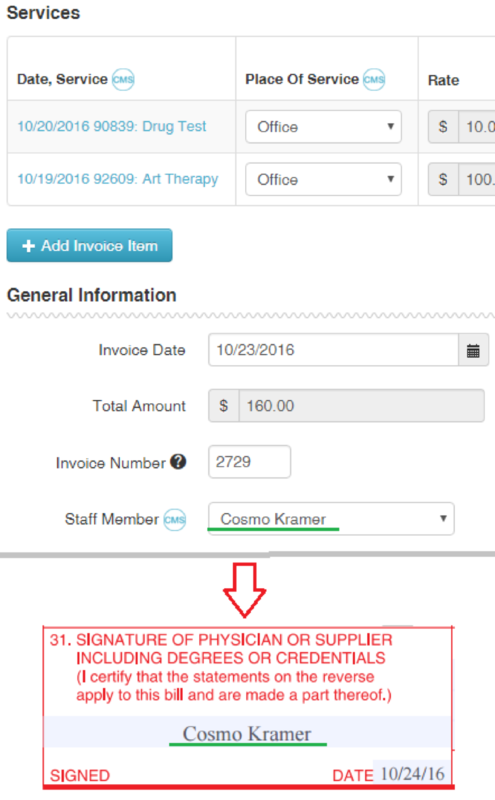 If no staff is associated with invoice, then "SIGNATURE ON FILE" is printed. Date: date of form creation. Line 1 – Facility Name, i.e. Organization's legal name.Line 2 - Location Address: Number, Street, Suite. Line 3 - Location Address: City, State, Zip. 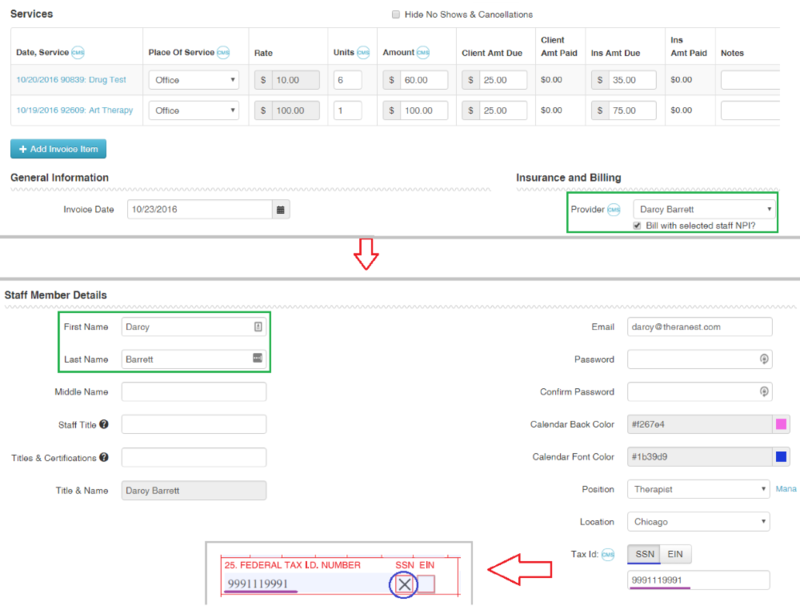 If invoice's service item has associated appointment, Location is pulled from the appointment. Otherwise it's pulled from the Client Details page. Box 32.a is facility NPI of Location. If it's not specified, then Facility NPI of organization is used. Box 32.b. is not filled by TheraNest. 1) Billing provider address values and Phone Number are taken from "Send Payments To (if different from Location)" section, and if it's empty (i.e. all fields of the section are empty), then values from "Location Address" section are used. 2) Billing Provider Name: if "Bill with selected staff NPI?" box is checked and Provider is selected, then this Provider's name is used. Otherwise Organization's legal name is used. Contains Billing Provider's NPI. Otherwise organization's NPI is used. Field is constructed from qualifier and ID Number of first valid Additional ID of current Insurer. - its qualifier belongs to allowed qualifiers. 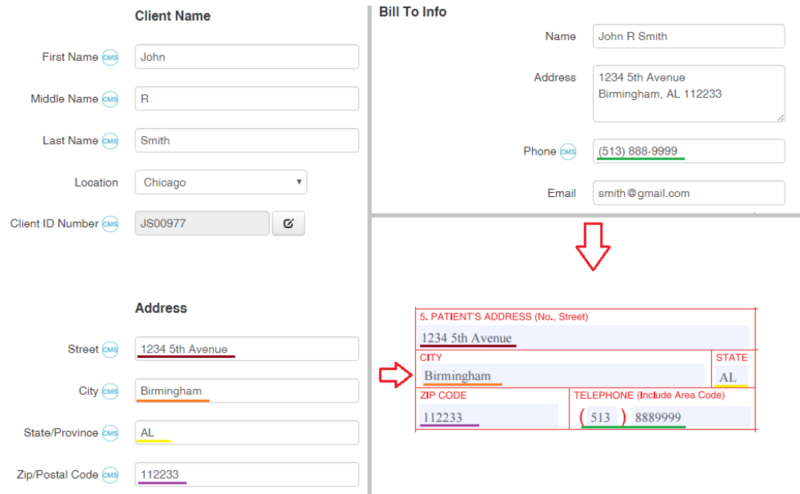 - "Related To" field is "Organization & Any Staff" or Billing Provider's name. - "Related To" field is "Organization & Any Staff" or "Organization".